Mike B314 created one of the finest WindowBlinds skins ever made when he designed Sirus. It has become my most favourite skin ever and I haven't changed it since the skin was released except to test a few others and work on some of my own. When Mike gave me permission to make a cursor to match I was really pleased as I wanted my whole suite to match. BIG thanks to Mike for the original skin!!! Awesome! Nice colors and Ani! can u post a cursorxp version ? I love this cursor, the animations are superb! The colour changing options are awesome! 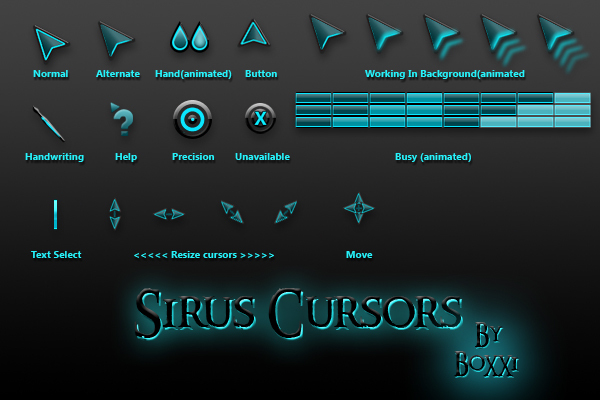 When will you be doing some more cursors?